Staying in a luxurious Bali villa has more to offer than fresh mangoes by the pool every morning. Perhaps one of the sweetest treats on hand at the Seminyak villas is the convenient proximity to the world renowned yoga studios that Bali is so famous for. If it’s your first time travelling to Seminyak it can be slightly overwhelming choosing which place to get moving and sweating, or chanting and meditating. We’ve put together a list of four top studios in Seminyak that are loved by long-term residents as well as those who’ve passed through during a short stay in Seminyak accommodation. This is the place to go for the more traditional students of yoga who are equally interested in yoga philosophy as they are in embodying this centuries old practice. Primarily an Ashtanga studio, the Seminyak Yoga Shala observes Moon Days as times of rest from their otherwise strenuous practice. During full and new moon days it is believed that the enhanced gravitational pull from the alignment of such large masses, such as the moon and earth, causes us to be more emotional and less grounded. They believe that we, like our planet, are made up of 70% water and are therefore just as influenced by the natural cycles of Nature and outer space. The full moon represents an intensity of energy that renders us headstrong and less connected to the physical body, while the new moon is a calm trough in our natural energy levels and represents a time of much needed rest and rejuvenation. The schedule contains classes 7 days a week (except moon days of course) and features Ashtanga, Vinyasa, Hatha and Mysore Ashtanga. There are four experienced teachers on the roster, all with their own individual and unique way of presenting the yoga asana practice. Locals tend to recommend this place to students who already have a dedicated practice as the classes do tend to be on the more advanced side. Come to this studio to immerse yourself in the old wisdom of the Upanishads and Patanjali’s yoga sutras and to direct your energy inward. Classes range from roughly $11 AUD for a casual drop in to $141 AUD for a monthly pass. If you’d like to get in touch before you visit, check out their website here. This studio is a unique balance of calmness, serenity, and peace with teachers that are vibrant and full of life and enthusiasm. Many new and long term students claim that classes here are among their favourite anywhere in the world. The four much-loved teachers on the roster offer a range of flowing Vinyasa style classes daily, as well as Yin Yoga three evenings a week. The studio founder, Sagi Jessie Degon, even developed a class called Creative Vinyasa that is open to all levels of students who are willing to test their boundaries and get out of their comfort zone. For the dedicated and curious yoga students, the studio also puts on intensive workshops and retreats in addition to the daily schedule. In the past they have done one-day Transformational Breath Workshops as well as week long retreats. The retreats allow students to delve deeper into not only their physical practice but also their psychological and emotional personal development. Walk-in classes are less than $10AUD and class passes are also available at a discounted rate. To see more details and the full schedule, head over here. Desa Seni is a delight in itself and its yoga classes only add sweetness to the mix. Located a short motorbike ride out of town, this spot is nestled within a quiet resort with native plant life all around the open-air studio. Yoga classes are open to the public and can be taken as private one-on-one sessions, or group lessons. With an emphasis on mindfulness and meditation, the classes range from Vinyasa flow to Yin Yoga, to Hatha. 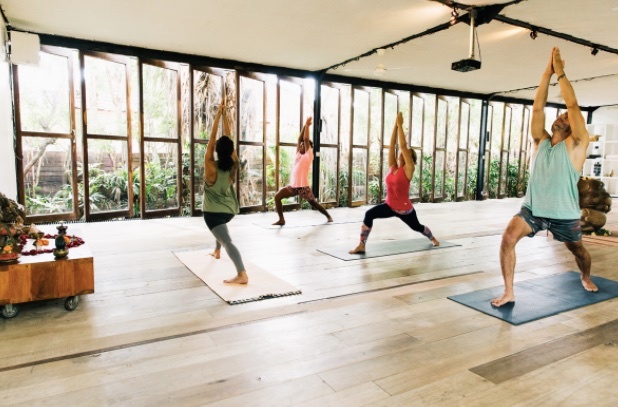 There is even an Ashtanga style class offered in the evening called “Sunset Flow” that makes for a perfect way to wind down before heading back to your Seminyak Villa. Students should note the class level indicated on the schedule before choosing a class as some are designed to be a more advanced practice. After your class you can wander the grounds to check out the art village or book in for a treatment at the luxurious spa. Bikram yoga is not for the faint of heart but seems to have gained its own cult following over the last decade. The practice consists of 26 postures that are performed in the same way each time and are thought to improve flexibility as well as internal organ function and general metabolism of the whole body. The movements aren’t easy as it is, and combined with temperatures of over 33 degrees celcius, you will never leave feeling like you haven’t got your money’s worth. Before you leave your Seminyak villa, you might want to remove jewelry, watches etc. and forego the perfume and body lotion! Nobody finishes the class without a puddle of sweat around them. Students of the studio seem to agree that the extremely friendly reception staff and lovely facilities make the tough work just a little bit softer. The studio offers a new student 3 class pass for roughly $32 AUD, or $16 AUD for a drop in. New students should read the info on the website about how to prepare for the first class. You can do that and check out the full schedule here. Now you can book your Bali Villa in Seminyak with confidence that you won’t be missing out on your daily health regimes. The yoga culture is rich and vibrant in Bali and will surely inspire you to get amongst it.